This scenario came from Chris Leach's Fields of Glory (Figure 1 and Photo 1). 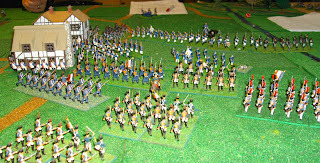 To win, the Prussians had to exit as many of their 'divisions' as possible from the western, French, side of the table. Photo 1: The initial set-up viewed from the French side. The key village of Plancenoit is in the top right of the photo, with Simmer's Division on the hill at the bottom. 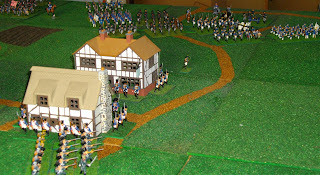 The scenario began at 16:30 with the Prussians moving first. Von Hiller's and von Losthin's brigades came on in the direction of Plancenoit and the wood north of Plancenoit respectively. Prince william's cavalry moved down the northern side of the battlefield towards Subervie's waiting French cavalry. The French then had their first turn and oh, what a turn it was. On the French left flank, Subervie's cavalry did an about turn, presenting their rear to the approaching cavalry of Prince William (Photo 2). 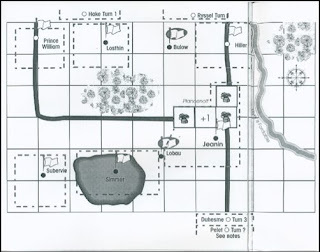 Lobau’s "cunning" plan had been to leave Simmer's 19th Division on the high ground north-west of Plancenoit to defend his left while Subervie's cavalry redeployed to his right flank so as to join the approaching Young Guard in an attack around the Prussian left. He had expected the cavalry to undertake a wheel to effect this manoeuvre, but they were instead compelled to about turn. The Prussian commanders could not believe their luck; "we’ll clean up these French in no time after a stupid manoeuvre like that one" (Photo 3). Photo 2: Facing the wrong way; Subervie's light cavalry about face to follow their orders to redeploy to the French right flank. Photo 3: A smug Prussian commander enjoying French stupidity. Lobau still hoped that Subervie's cavalry would be able to escape this disastrous start and outrun their pursuers, but it was not to be. They were caught, still facing rear, and dispersed (Photo 4). This left Simmer's infantry to defend the French left, as planned, but without the benefit of the cavalry support to the French right flank. 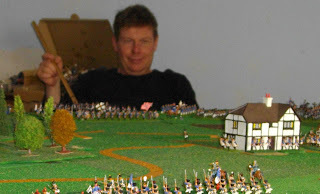 He formed his left-hand units into square to face off Prince William's cavalry and redeployed his other troops to await the expected assault by von Losthin's men (Photo 5). Photo 4: Subervie is a lonely figure after his troops had been broken or driven from the field. Photo 5: Simmer's Division redeployed to protect the French left flank. The attack on Plancenoit was lead by von Hiller's 16th Brigade, two-thirds of which were landwehr (Photo 6). Bülow sent these troops to assault the town from the south-east. Plancenoit was defended by Jeanin with the 20th Division which, while only two-thirds of the size of Hiller's force, consisted entirely of regulars who were defending a strong position. These factors were to prove telling. Photo 6: von Hiller's 16th Brigade move to their south-west to approach Plancenoit from the south-east. While these developments were occurring on either flank, in the centre, von Losthin's 15th Brigade was slowly making its way through the woods north of Plancenoit, headed in the direction of Simmer's 19th Division. Both sides were soon bolstered by the arrival of reinforcements. Duhesme’s division of six Young Guard infantry battalions entered the battlefield to the west of Plancenoit (Photo 7), while von Hake and von Ryssel arrived to support the Prussians. Seeing the way in which von Losthin was being delayed by the wood, Bülow sent the von Hake around to the south to drive between the woods and Plancenoit. Von Ryssel was ordered to attack the town from the north-east (Photo 8). Photo 7: The French receive quality reinforcements in the form of Duhesme’s Young Guard. Photo 8: For the Prussians von Ryssel's newly arrived brigade attacked towards Plancenoit from the north-east. The Prussian attacks on Plancenoit did not go as planned. The combination, already mentioned, of generally better quality French troops, combined with the strength of their defensive position in the village allowed Jeanin's men to easily see off the first attacks from von Hiller's men. Then, when joined by Duhesme's Young Guard, they aggressively counter-attacked driving into von Hiller's shocked troops (Photos 9–11). Prussian high command were beginning to feel decidedly uncomfortable (Photo 12). Photo 9–11: French counter-attack by Duhesme's and Jeanin's troops drives into von Hiller's Prussians. Photo 12: Worries for Prussian high command. Meanwhile, on the northern side of the battlefield, von Losthin's Prussians had emerged from the wood and immediately assaulted Simmer's position (Photo 13). They too found the attack heavy going, losing casualties in the approach. They were not aided by the poor accuracy of their accompanying artillery batteries. Photo 13: von Losthin's 15th Brigade emerged from the wood and immediately attacked Simmer’s position on the hill. Despite these initial set-backs, von Losthin began to wear down Simmer’s men. The situation started to become perilous for Simmer with the arrival of support from von Hake (Photo 14). Then, a strange thing happened. Urged by Blücher to drive forward to support Wellington’s left flank and thus to pressure the right-rear of the main French army—in the form of a re-reading of the scenario victory conditions—Bülow ordered his entire army to drive with all speed to the western edge of the battlefield. Photo 14: 19th Division under pressure from von Losthin’s brigade to the front, with von Hake approaching the right flank. This gave rise to the strange situation of the Prussians marching past the French positions, with Jeanin’s infantry and Duhesme’s Young Guard infantry in hot pursuit (Photos 15 and 16). The Prussians pushed on, like automatons, the jeers and volleys from the French infantry ringing in their ears. Simmer’s men were not entirely saved by this somewhat bizarre turn of events, ending the battle surrounded and facing imminent destruction (Photo 17). Photos 15 and 16: The Prussians drive for the western table edge pressured by Jeanin’s and Duhesme’s men. 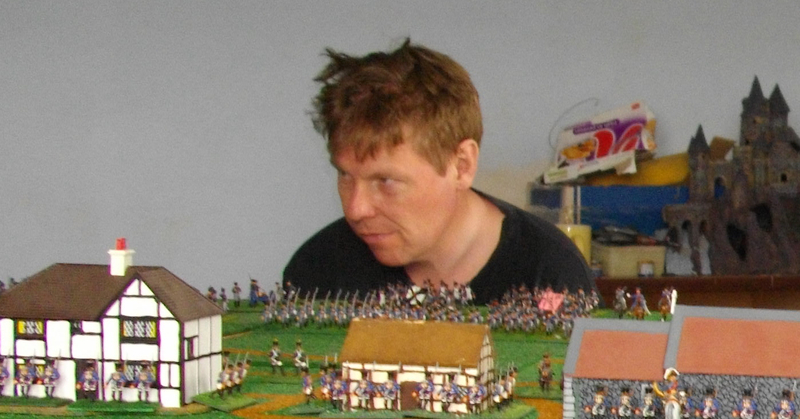 For the Prussians the move from trying to win the battle to trying to win the scenario had been made too late. 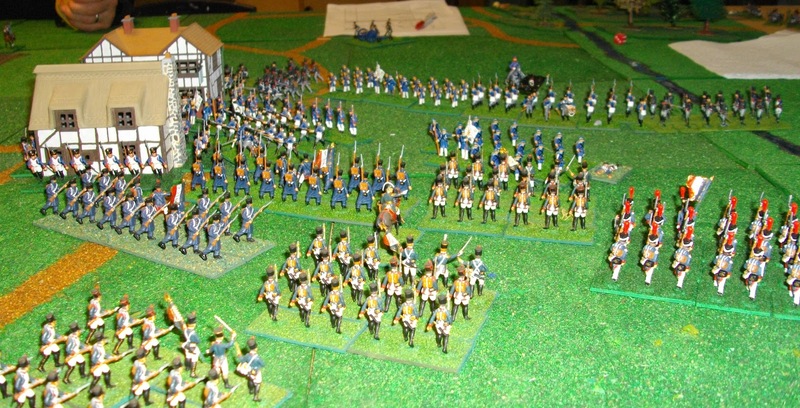 With Plancenoit firmly in French hands and only one Prussian ‘division’, Prince William’s cavalry, entirely exited off the French side of the table, the battle was a clear French victory. It is always good when a plan comes together and the French were most pleased with the result; particularly after such a terrible start. French bragging rights were increased by the fact that the Old Guard had not been required. It had been a near run thing, but a damned nice thing... for the French! That sounded like a great game! Scenarios involving "get your men off the other side of the board" are always interesting as the aggressors are left with the difficult choice of fighting, or by-passing, defending troops. Given the opening misfortune of the French cavalry, I did not expect it to turn out as it did! No, neither did I. I thought, "oh %&#@ I have really stuffed up this one". It's funny, and nice, that each game we do seems to be "the best one yet"; usually irrespective of the outcome. Thanks Steve. We are pleased to have others looking st this snd showing interest. It was a fun game and one of my favourite... nothing to do with the outcome! Apologies for the mis-typed as!